French banks have called for an end to violence against branches, cash machines and personnel as the country witnessed the 20th day of "yellow vest" protests on Saturday. Since the anti-government protests began in November, more than 760 banks have suffered damage. "It is time for all to condemn acts committed against banks," the French banking federation's executive committee said in comments published in the daily Le Monde. In Montpellier, protesters marched through the city centre, shouting slogans such as "more taxes, but where is our money going? ", and nearby, on the boarded up windows of a bank, appeared the graffitied words "BNP pay your taxes". 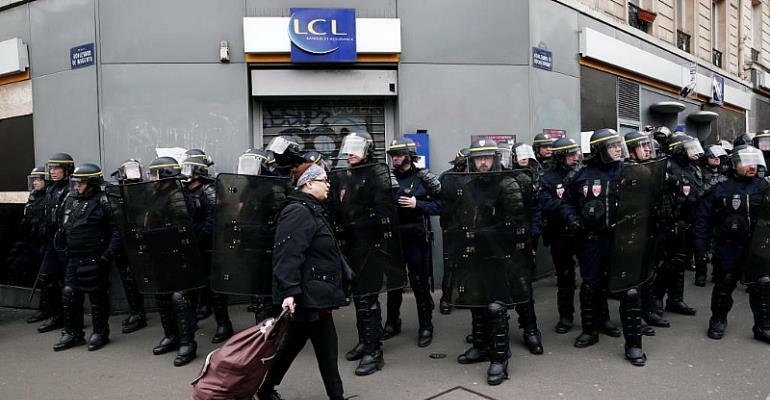 Banks have been the targets of vandalism and arson during the recent protests, and last week 11 people were injured when a Banque Tarneaud branch was set on fire near the Champs Elysees. The federation called for order to be restored "so that our colleagues and shopowners can work safely" and meet their clients needs. "We must quickly put a stop to this unbridled and unjustified violence," it said. The banking federation's executive committee comprises the bosses of six large French banks; BPCE, BNP Paribas, Credit Mutuel, Banque Postale, Credit Agricole and Societe Generale. "For a little more than four months, hundreds of local branches that are essential links in local life... have been targeted, vandalised, pillaged and burned, and bank officers physically threatened," the federation said. With taxes a key trigger in the initial protests, it said French banks were the primary contributor to fiscal revenues, paying 644 euros ($720) for each 1,000 euros in net profit, excluding social charges. France counts 37,000 bank branches and the sector employs more than 360,000 people. "Bankers represent those who have the power of money, the ultimate power to satisfy most people's desires. So it's quite normal for people to see them as suspicious," explains Alexandre Delaigue, economy professor at Lille University in an interview with Capital magazine. "Hating bankers is not just something you find in the Western world. It's is multicultural and is reinforced by the existence of loans with interest which has never been well accepted. Lenders have always had a bad reputation in Islam and Catholicism for example."